Earlier this month, I went to Norway to live out my bizarre lifelong dream of turning a birthday in the Arctic Circle. I did a tonne of cool stuff – drove a dogsled, met some awesome people, jumped in a very cold sea, and ate a reindeer hotdog (it was delicious). I also went to a polar exploration museum, where, in addition to seeing some cool boats and historic artefacts, I saw a bunch of games. I’ve written before about my obsession with polar exploration, especially my fascination with the day-to-day life of these heroic (and often ill-fated) expeditions. On my trip to Norway, I spent a couple days in Oslo, where the one thing I was determined to do was go to the Fram Museum. The Fram Museum is a museum about Norway’s polar explorers that houses two historic boats: the Fram, a boat that sailed to the Arctic and Antarctica, and the Gjoa, which was the first boat to navigate the Northwest Passage. The locals I met seemed charmed by my intense desire to see a museum that they probably all got dragged to as kids, but I couldn’t believe I got to go on boats that Fridtjof Nansen and Roald Amundsen had actually stood on. I spent hours nerding out intensely over all the fascinating things the museum had to offer, but in particular the games. In Farthest North, his account of the 1893-96 Fram expedition, Nansen writes that the crew had “relaxation in the shape of cards, chess, dominoes, halma, music, and story-telling – how should any one be ill?” Though you would think polar explorers were constantly fighting for their survival, many of these journeys involved copious amount of downtime. Scheduled entertainment was as important to keeping sailors healthy as good food and warm clothes. “[A]bout half-past seven or eight cards or other games were brought out, and we played well on into the night, seated in groups round the saloon table,” Nansen explains of their schedule. Later in the book he praises the “constant gaiety” present in the saloon where the men relaxed, and I spent a long time standing in the Fram’s saloon trying to imagine what it would have felt like to try to focus on games while undertaking such a dangerous journey. 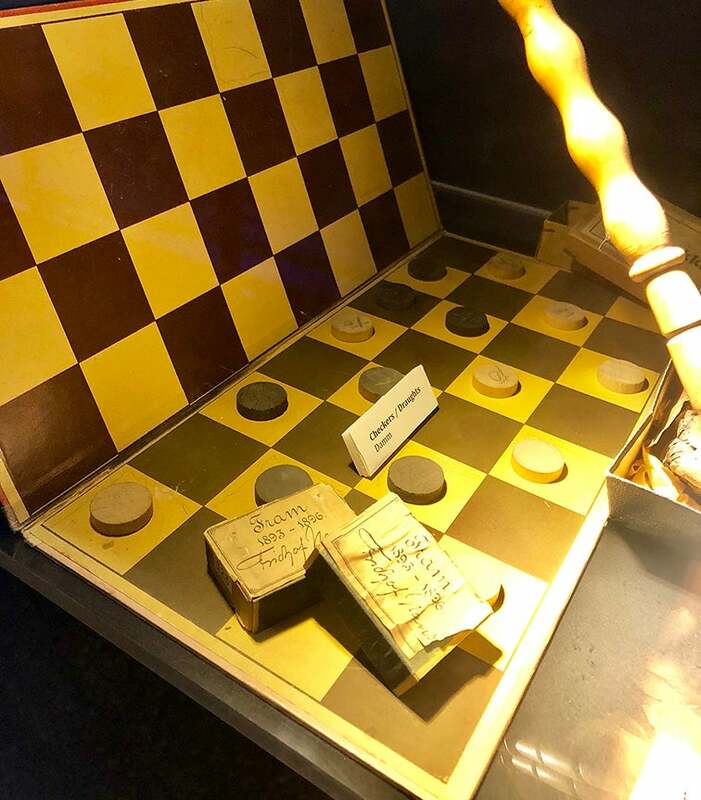 The Fram Museum had a draughts board at which Nansen’s men might have played some of the games he writes about. 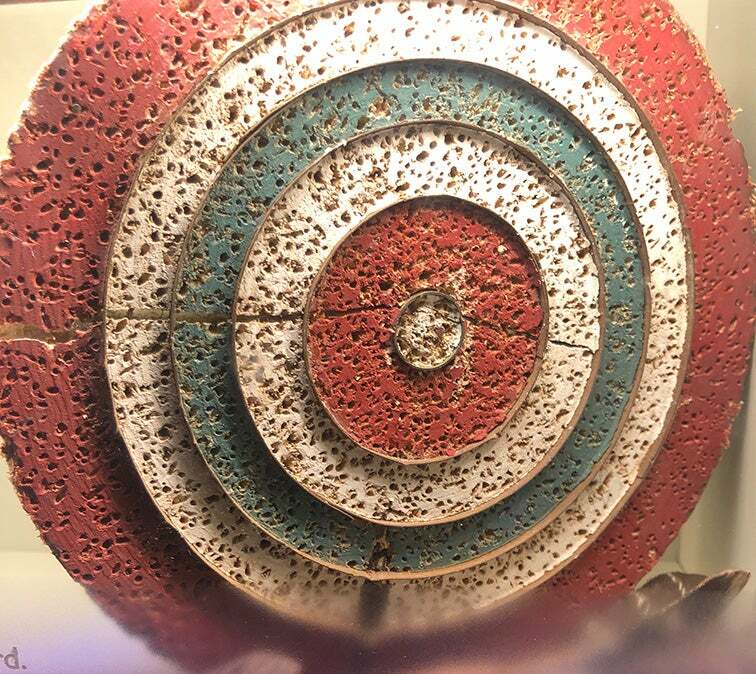 I was fascinated by how many holes were in this dartboard, how clearly well-used it was. I couldn’t imagine playing darts could be the most exciting thing to happen in a day when you’re trapped in the Arctic ice – it seems both frivolous and amazing. In my daily life, even as a games journalist, it can be hard to find time for games. At other times, even though it’s my job, it can feel wasteful to play games when there’s so much else I think I should be doing. Looking at the games on board the Fram and reading about the role of games in Nansen’s expedition was a surprisingly moving reminder of how important it is to make time for play and the positive effects it can have. It was exciting to think about how much joy something as simple as a Christmas present that could be played together with friends could mean to people in extreme situations. The routine here is as follows: Four of us, myself, Stevens, Richards, and Spencer-Smith, have breakfast at 7 a.m. The others are called at 9 a.m., and their breakfast is served. Then the table is cleared, the floor is swept, and the ordinary work of the day is commenced. At 1 p.m. we have what we call ‘a counter lunch,’ that is, cold food and cocoa. We work from 2 p.m. till 5 p.m. After 5 p.m. people can do what they like. Dinner is at 7. The men play games, read, write up diaries. After dinner had been cleared away, some men sat on at the table occupied with books and games. Others dispersed to various jobs. In the matter of games it was noticeable that one would have its vogue and yield place to another without any apparent reason. For a few weeks it might be chess, which would then yield its place to draughts and backgammon, and again come into favour. All of these people made special time for games in their lives, no matter what was going on. I brought my Switch with me on my trip to Norway, and as I was packing I thought about how frivolous it felt to make space for it in my luggage. Why would I want to play games when there would be so many new things to explore? But when I thought about polar boats making room in their limited holds for entertainment, or about expedition leaders holding back games so they could surprise people on special occasions, I saw my own decision to bring my Switch in a different light. 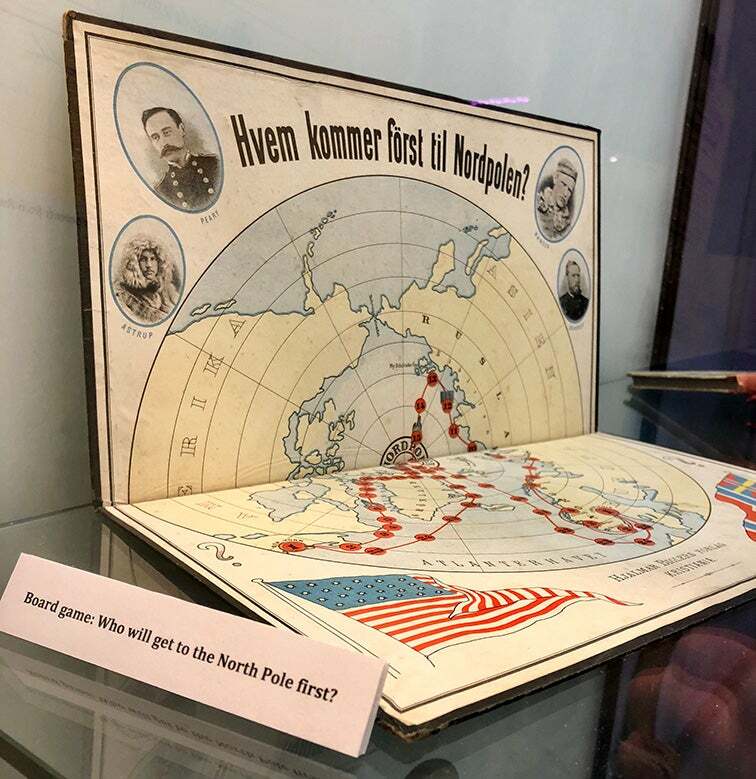 In addition to games from the expeditions themselves, the Fram Museum also had a board game about the race to the North Pole. In my polar obsession, I’ve spent a lot of time trying to track down board games and other entertainment that came out of what’s called “the heroic age” of polar exploration. I’ve long been curious about how cultures reinterpreted these wild stories into play, and how games might have let people at the time take part, in some small way, in the feats they were reading about in the news. Other games were produced during the “heroic age” about polar explorers, including ones about Shackleton and one, pictured below, about SA Andree, who tried to sail a balloon over the North Pole in 1897. 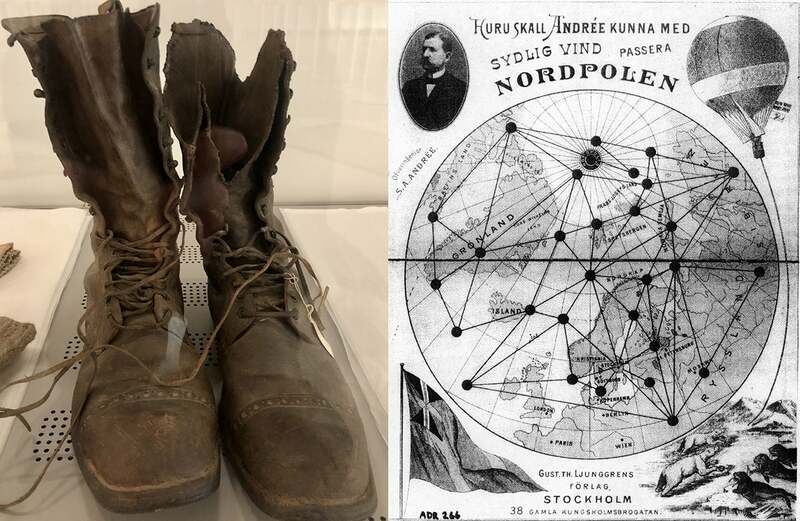 The Fram Museum had some boots recovered from the Andree crash site that I couldn’t stop staring at. I’ve been trying to track down the Andree game ever since seeing a picture of it on the internet, and it was fascinating to me to compare the material fallout of his tragic expedition with how game designers had imagined it would play out. Seeing all the games at the Fram Museum helped me put my own ideas about play and pleasure into a new context. Things like games or snacks, the stuff we write about every day at this site, played such a vital role in the historic events I love reading about. Though the age of polar exploration feels so far removed from the realities of my daily life, learning about the games polar explorers played makes it seem a little more real.